This is the third year I’ve participated as a mobile station in the annual Idaho QSO Party (IDQP), and this one was at least as enjoyable as the first two. My first trip in 2013 took me through Western Idaho from Elmore county north to Bonner county through 13 counties in total. I had never been in any of the counties south of Nez Perce county, so it was fun exploring new territories. Then, in 2014, I undertook an ambitious 26 county trek beginning in Teton county in east Idaho and ending on the Payette–Washington line in west Idaho, and covering all southern Idaho counties less four in the SE corner of the state. For 2015, my intent was to improve the 2014 route, execute the plan better and do so with a better mobile station. In the months leading up to the 2015 IDQP, I spent a lot of time with mapping software trying to squeeze in a few more counties. My main constraint was to end close to the Washington or Oregon border to facilitate a drive home on Sunday night. The best I could find was to trade off a bit of sleep in order to add a single new county (Lemhi) to the mix. I made a few other minor changes to the route and stops, and changed the timing of some stops. 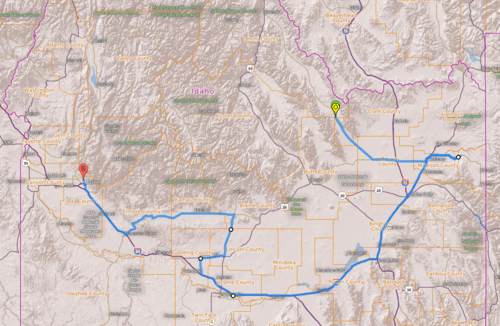 The plan for day one begins on the Lemhi–Clark county line on the Salmon highway followed by an eastbound trek to the Madison–Teton county line. 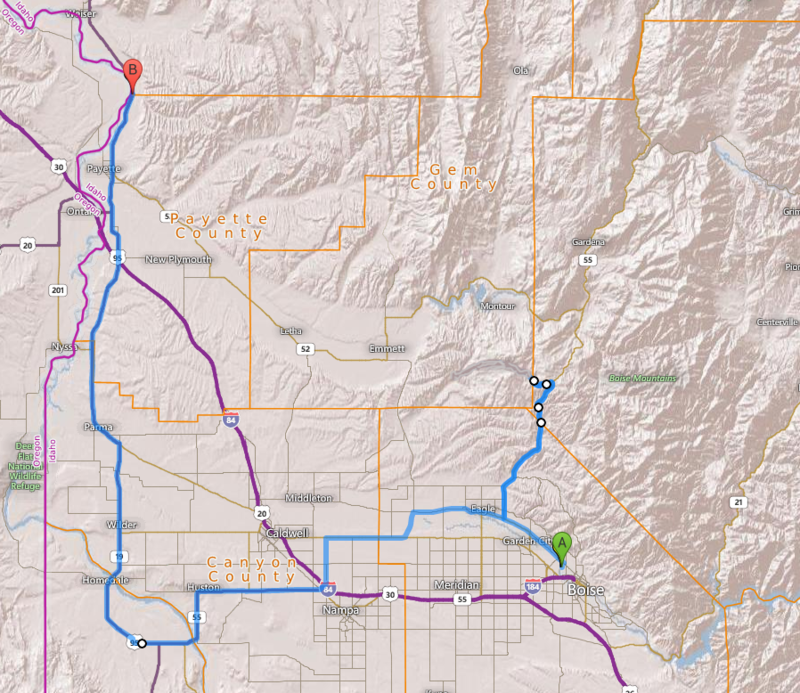 From there, the route backtracks a bit before heading south, eventually taking a short spur into Twin Falls county. 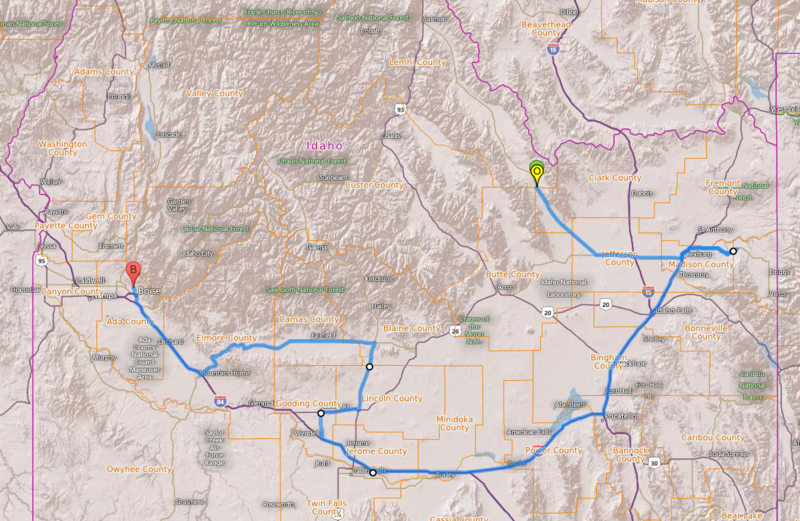 From there the route zig-zags north to Blaine county and then west through Camas, Elmore and ending at a motel in Boise (Ada county). Sunday morning begins before sunrise with a trip up to the Boise–Gem county line located several miles down a dirt road off of highway 55. 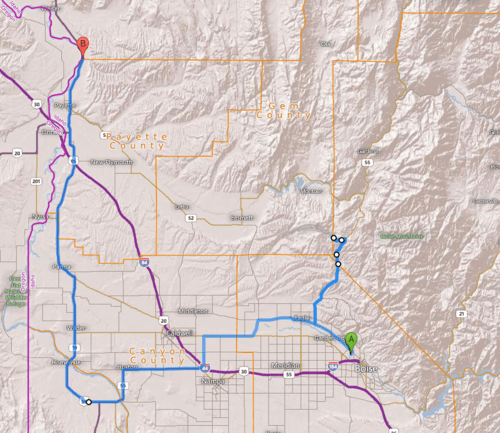 The route backtracks from there through Ada county into Canyon, takes a detour through Owyhee county and then north through Canyon, Payette and ends on the Payette–Washington county line. The primary radio was a Kenwood TS-480SAT putting out 100 watts. Additionally, two Yaesu FT-857Ds were available as back-up rigs and for some special purposes (discussed below). As it turned out, the two Yaesus got almost no use. The rover vehicle was my trusty 1988 4WD Toyota pickup truck. I purchased this vehicle with almost 200,000 miles on it in 2013 just before using it in my first IDQP. Four antennas were used for the contest. Three antennas were homebuilt screwdriver antennas. Two screwdrivers were mounted toward the rear of the bed. Each screwdriver had a daytime configuration and a nighttime configuration. The passenger-side rear antenna had a stinger with a small capacitance hat on it about two thirds of the way up. This antenna was my primary 20m antenna during the day and could go to 40m at night. The driver-side rear antenna had a stinger with no capacitance hat. This antenna was primarily used for 15m during the day and 20m at night. Just behind the driver, toward the front of the cab was a 1/4 wave 10m whip. This antenna was for 10m, and connected to a Yaesu with an LDG antenna tuner. The antenna was a perfect match without the tuner, but the tuner would allow me to use the whip on 15m or 20m, should the need arise. Why would the need arise, you ask? Well…suppose a low hanging branch took out a couple of screwdrivers… The antenna was only used for 10m, but rather fruitlessly. The third screwdriver antenna was on the front of the truck, mounted in an Alliance HD-73 rotor. The rotor is normally used for VHF and UHF rover operations, but it makes a fine platform for mounting one screwdriver antenna. This antenna had a large capacitance had made of stainless steel wire and an aluminum central hub. A stout 3.5′ stainless stinger supports the hat and allows the antenna to be tuned from 80m down to 20m. It was used as a 40m antenna for the day configuration and an 80m antenna for the night configuration. A cross-over switch was used to swap the front screwdriver and the rear driver’s side antennas between the other FT-857 and the Kenwood. That allowed me to use the FT-857 to, say, hunt for 40m stations while 15m was still open on Saturday. Or look for 15m activities on the FT-857 early on Sunday morning while using the front antenna on 40m with the TS-480. All logging was done on paper, using a clip board firmly attached to my right leg and mechanical pencils with stout 0.9mm lead. Driving and logging isn’t for everyone. It takes much careful practice, but one can learn to operate a radio and log safely while driving. Usually I stick to CW while driving because it ends up being less distracting (don’t ask me why…it is just that way). The contest began for me on Friday morning, in Redmond, WA, with a 12 hour drive to Idaho Falls. I didn’t quite have my station completely assembled, and the antennas were stowed in the back of the truck for this part of the trip. Speeds of 70 or 80 MPH put wear and tear on the screwdriver antennas, particularly the finger stock, so I didn’t want to add to this unnecessarily. Fortunately, the contest begins at 1pm local time, giving me plenty of time to sleep-in, finish station and antenna assembly and get to my starting point. On Saturday morning, I drove to a parking area near the Clark–Butte county line that I remembered from past contests. I arrived with three hours to kill, with a 20 minute trip to the Lehmi–Clark starting line. That was plenty of time to install antennas, tidy up wires, set up log sheets, eat, make a few phone calls, monitor the bands, check the oil, and kick the tires. The Lehmi–Clark line had plenty of room to safely park on the county line. Twenty meters CW seemed like a good place to start. My buddy Doug, AC7T, immediately came back to my CQs. Of course, it helped that I had been on the phone with him an hour earlier, killing time before the start. But I only worked one more station before switching to 20 phone. This also yielded only a couple of QSOs. Fifteen meters was in better shape and I managed a couple of short runs on both CW and phone, including a handful of European stations. Aside for a brief 15m run on the Clark–Butte line, the band was never really as productive as 20m for the rest of the IDQP. Twenty meters CW and phone became relatively productive as I traversed Clark, Butte, Jefferson, Madison, Fremont, and Madison again on my way to Teton; still, I could tell conditions were significantly down compared to the two previous years. By the time I left Jefferson county for the final time, almost 300 QSOs had been logged (including a couple dozen duplicates), and 185 multipliers. One of the fun things about the IDQP (relative to, say, the Salmon Run or 7QP) is that mobile stations accumulate multiliers anew with each county and by mode. Hence, I tried to spend time working phone and CW in each county. Traveling through Bonneville, Bingham and Bannock counties produced moderate QSO rates on 20m. I hit Power county at about 0100 UTC, and 20m was fading; but 40m wasn’t quite ripe yet. The QSO rate went way down through Cassia and Minidonka counties, with a mix of 20cw and 40cw. Perhaps the only saving grace was the kick of working OM2VL in both counties…on 40m, no less! Fourty meters improved a bit in Jerome county. Again, I worked OM2VL. The QSOs came one per minute (phone and CW) after crossing into Twin Falls county for a 30 minute stay. Back in Jerome county at 0350 GMT, the first 80m QSOs came through with W7GF in Oregon and KG7E in Custer county, ID. But it was back to 40m CW for a rate of about 0.5 QSOs per min. The rate slightly improved and 80m showed some improvement in Gooding and Lincoln counties. Fourty meters was fading during a brief stay on the Lincoln–Blaine line. A big surprise was working OM2VL (again!) at 0529 UTC on 40m CW as I got rolling through Blaine. Shortly after that, it was all 75m and 80m for the evening, and the rates were pretty low for the 2:45 minute trek through Camas, Elmore, and Ada counties. Essentially, each QSO took 12 minutes. I deeply appreciate the few people (esp. W7GKF, KB7N, NU0Q) that stayed up late and followed me for across these counties. Sunday morning I was on the road by 1315 GMT (7:15 MDT) some 30 minutes before sunrise. There was no activity on 15m or 20m, but I managed a pair of 40m CW QSOs while en route through Ada county. I arrived on the Boise–Gem county line just a few minutes late. This is my favorite county line in Idaho, being on a dirt road at 4,200′ in the middle of the rolling Boise Mountains. It was difficult to scare up QSOs this particular Sunday morning. I finally managed to get a small run going on 20m phone, followed by 20m CW. CQing on 40m got a single response from Doug, AC7T. I only managed a handful of other QSOs on 15m and 20m before my hour was up. In all, the Boise–Gem line produced 38 QSOs in one hour, which was a bit disappointing. Last year, I arrived at the same time, stayed for a little over an hour, and made 116 QSOs—mostly on 20m, but including 12 QSOs on 40m and 32 QSOs on 15m. I think this exemplifies the difference in conditions between last year and this year. But don’t take this as a complaint…the entire challenge of radiosport is taking the conditions you have and maximizing one’s score. By 1600 UTC, I had passed through ADA and into Canyon county, and 20m started showing more life. Rates returned to almost normal in Owyhee county where a 50 minute stay produced 40 QSOs, primarily on 20m. Last year I spent a few minutes longer than that in Owyhee and came away with 60 QSOs split between 20m and 15m. Fifteen meters continued its lackluster performance for the rest of the contest, as I worked my way through Canyon county again, and through Payette up to the Washington–Payette county line. The last hour of the contest was pretty good. I made 39 QSOs x 2, all on 20m. I tried 15 and 10 meters as well, but there was nothing doing. Last year, I spent the last 35 minutes in the same spot and worked 38 x 2 QSOs. For the last few minutes of the IDQP, I went into search and pounce mode for the first time in order to work some strong WIQP stations on 20m phone and CW. I spent a few days entering paper logs into the computer and doing the scoring. In the end, I had 724 QSOs minus 33 dupes for 691 valid QSOs; of these, 530 were CW and 161 were Phone. For mobile stations, multipliers accumulate for each new county and by mode. There were 365 CW and 119 Phone multipliers for a total of 484. Last year’s efforts produced 802 QSOs and 491 multipliers. So there was a 14% decrease in QSOs but only a tiny decrease in multipliers. Some of the decrease in QSOs resulted from trying to do more phone QSOs in order to bump up the number of multipliers. The following table shows the breakdown of multipliers, CW QSOs and phone QSOs by county activated. The final score is found by multiplying points by multipliers giving 590,964. This is down a bit from my score of 715,387 last year, but no complaints. It felt like everything worked better in 2015 (except the atmosphere) and I am very happy with the station improvements, plan execution and the score. As I did last year, I must conclude that the IDQP is a blast to work mobile. Idaho has small counties, outstanding roads, and stunning scenery. If you’ve ever wanted to do a mobile HF contest, this one definitely should be at the top of your list. The RF conditions were rather down this year, but last year’s conditions seems spectacular. The weather cooperated, with only a few sprinkles. The skies were mostly overcast, which is perfect for my old truck without AC. Many thanks to everyone who participated within state and outside of Idaho. I had a great time. Jerry, K5YAA help me with QSL’s. Long time ago he sent my QSL to you direct ( for IDQP and 7th QP, but unfortunatelly till today I dont got your QSL. It’s will be new counties for me. PLEASE your QSL, it will be BIG help for me to reach my goal – 3.077 county! Your QSL card will be coming very soon. My printer died a few months ago and I have run out of cards. The VHF contest season has absorbed all of my energy for a few months. But, I’ll fix or replace it very soon and will send your card. Thank you very much!!! Also for the many rare counties for me.